Here you can find a strain description about T-34 and also some user-based reviews and infos directly from the SeedFinder (if available). You can also find the offers and auctions here if T-34 cannabis seeds are on stock at MyCannapot right now. This variety leaves no room for compromise, as well as the famous Soviet T-34 tanks, armor on which our ancestors took Berlin in 1945. Easy cultivation, power and brightness effects, superb medical characteristics - a worthy response to our breeders famous foreign varieties. T - 34 Combines the best genetic lines of hashish varieties INDICA. The rapid growth, maturation speed and ease of cultivation turns ordinary growing into a real pleasure. 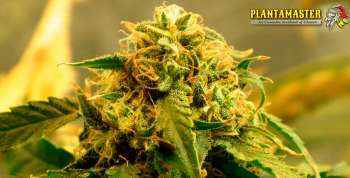 The volume and quality of the crop of dense, crystal-coated resin and flowers lead to about 450 grams per plant outdoors and about 350 grams when grown indoors. Of medium height, with dark - green leaves bush the T - 34 produces large flowers dense and responds well to all growing methods - SCrOG, SOG, LST. Starting from the middle of flowering, the plant produces sophisticated and unobtrusive smell, not like the skunk, with hints of summer flowering meadows, land and musk. It is easy to tolerate the stresses of moderate severity, and the smell can worsen with stress. Well treated product greatly enhances the flavor, and the use by a vaporizer allows you to enjoy taste T - 34 in a variety of shades. Sweet and delicate floral flavor muskusno- saved about half an hour after drinking. Powerful medical effect T - 34 of the "PLANTAMASTER Seeds" will make it easy to cope with the pain of any origin, muscle spasms, anxiety, anxiety, stimulates appetite a bit. The psychoactive properties of varieties of hemp T - 34 is a bright and relaxing "social high" causing the sea of positive emotions from the very fact of your existence without fixing on the minutiae of consciousness, leading to a successful resolution of internal problems and psychological traumas. T-34 is not available at our shop at the moment!